In this modern age of digitalization, in which everyone has instant online access to old books, publications, inventories, sales records articles galore on nearly every artist and Pinterest posts dedicated to about every subject, it might be hard to imagine that there still existed somewhere out there a heretofore unknown important collection of art. Yet such is precisely the case of the Notman art collection whose works have inconspicuously remained together in the same family for three generations never having been published or publicly displayed since they were first acquired well over a century ago and which have been consigned to sell at Jackson’s International Auctioneers in Cedar Falls, Iowa on June 27th. The offered collection, which consists of a total of 55 works, features paintings by some of the most prominent American artists such as noted early modernists Marsden Hartley (American 1877-1943), John Marin (1870-1953), Hudson River painter Samuel Colman (1832-1920) as well as others, and each having been acquired directly from the artist or through a gallery representing the artist. To understand the collection and how it came to be, one must first go back in time to what Americans call the Gilded Age or what the French popularly referred to as La Belle Époque or the Beautiful Era. Indeed it was in this beautiful era in which many of the great American collections were assembled by patrons of the arts and subsequently went on to become the foundation of many a prominent museum’s collections. Yet now, at the dawn of the 21st century, it is amazing to see such a collection as wonderful as the Notman’s, assembled so many years ago, be unveiled and enter the market. One could say that the story of the collection really begins in Edinburgh, Scotland with the birth of Peter Notman in the year 1820. Together with his older brother, John (1810-1865), no doubt with wide eyes and big dreams they set sail for America in 1834. Both first settled in Philadelphia, Pennsylvania where John would go on to achieve notoriety as an architect. Whereas Peter would become engaged in the insurance industry and eventually move from Pennsylvania to New York and rise to the presidency of the Niagara Fire Insurance Company and Sanborn Publishing. In 1850, Peter Notman (1820-1893) married Jane C. Dunlop (1829-1905) of West Chester, Pennsylvania, and together they had five sons and two daughters. It was their second son, George Notman (1853-1929) who together with his wife Katherine (1859-1946), would build the collection now being offered at auction. George Notman was born in the fashionable neighborhood of Brooklyn Heights into the well to do family of Peter Notman in the year 1853. In 1880, he married Brooklyn native Katherine Howard whose mother (Pamela Colman) was the sister of noted American artist Samuel Colman (1832-1920) and who is represented in this collection by 17 paintings. George Notman would make his way to the top of the American copper mining industry, eventually rising to become the secretary and treasurer of the Phelps-Dodge Corporation, a position he held for 50 years. In 1885, George and Katherine built a magnificent summer residence in the Keene Valley (Adirondacks) New York named Eaglestowe, which remains in the family to this day. Katherine, who attended the Packer Collegiate Institute in Brooklyn, was a leader in the Suffragist Movement and studied music under Joseph Mosenthal (1834-1896). Together they had three children, sons Howard (1881-1964), Arthur (1882-1961), and daughter Winifred (1890-1979). It would appear that the first foray into collecting art by George and Katherine began in earnest in 1903 at an auction held at the American Art Galleries in New York. A New York Times newspaper article dated March 26, 1903 (page 9) begins with the headline “SALE OF COLMAN PAINTINGS – Artist’s Own Pictures and His collection of Other Canvases Bring $22,275.00 at Auction.” Interestingly, the article goes on to list each of Colman’s painting by medium and title followed by the successful buyer. A total of 17 paintings by Samuel Colman (the uncle of Katherine Notman) are listed as selling to the Notman’s and of which 8 are offered at Jackson’s. One of the paintings acquired by the Notman’s at the 1903 auction, a large oil on canvas measuring 32 x 72 inches and titled Kanawha River Valley, was donated by the Notman’s daughter-in law (Mrs. Arthur Notman) and their own daughter (Mrs. David C. Prince-Winifred) to the Smithsonian American Art Museum in 1968, collection number 1968.111. Both of the paintings by early American modernist, poet and essayist Marsden Hartley (1877-1943) being offered were likely acquired at the gallery of noted American photographer and modern art promoter Alfred Stieglitz (1864-1946). Stieglitz, who was the husband of Georgia O’Keefe, is often referred to as the Mother of American modernism. Stieglitz’s Little Galleries of the Photo-Secession (also known as “Gallery 291”-a reference to the address on Fifth Avenue) was one of the first galleries to exhibit modern art in America. 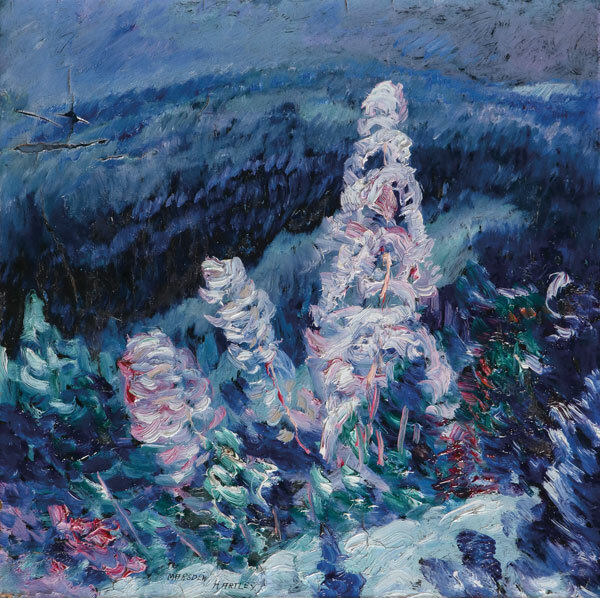 The offered paintings (Maine Landscape and Winter Landscape) would seem to correspond to a group of paintings exhibited by Hartley in May of 1909 from a series titled Songs of Autumn and Songs of Winter. The likely connection with the Notman’s and Stieglitz’s gallery was the relationship between Katherine Notman and artist Pamela Colman Smith (1878-1951), who were first cousins as well as nieces of artist Samuel Colman. In 1907, Alfred Stieglitz gave Pamela Colman Smith an exhibition of paintings in New York at his Little Galleries of the Photo-Secession making Smith the first painter to have a show at what had been until then a gallery devoted exclusively to the photographic avant-garde. Stieglitz was intrigued by Smith’s synesthetic sensibility; in this period, Smith would paint visions that came to her while listening to music. The show was successful enough that Stieglitz issued a platinum print portfolio of 22 of her paintings and showed her work twice more, in 1908 and 1909. It was the last show (1909) which corresponds with the exhibitions of Marsden Hartley’s and John Marin’s works offered now for sale at auction. Another possible connection between the Notman family and Stieglitz is the Notman’s distant relationship to the noted Scottish born Canadian photographer, William Notman (1826-1891), who had a studio in New York and whose work was known by Stieglitz. Both of the Marsden Hartley’s in the Notman collection remain in what are most certainly their original frames by George F. Of, a noted New York frame maker who was well known to have worked closely with Stieglitz and the modernist art he exhibited. Of the five watercolors by John Marin (1870-1953) being offered from the Notman collection, three retain their original “Photo-Secession” gallery label and all would appear to be referenced in Sheldon Reich’s catalogue raisonne on John Marin. Also included in the Notman collection are watercolors by American painter and traveling companion of Samuel Colman, Robert Swain Gifford (1840-1905), Charles Louis Mozin (1806-1862), Paul Marny (1829-1914), oils by Adirondacks painter George C. Parker (1862-1934), and drypoint etchings by noted French artist Paul Cesar-Helleu (1859-1927) as well as Whistler. The collection eventually came to Iowa via the son of Arthur Notman (1882-1961), John Notman (1919-2006), who moved to Clinton, Iowa in 1949 where he would eventually become the general manager of the Clinton Herald and the Trenton (NJ) Times. His wife Getrud, of 57 years, died in Clinton in the year 2015. The auction also features 500 additional works of art from other estates and private collections including works by pop artist icon Roy Lichtenstein (American 1923-1997), New York School artist, Robert Motherwell (1915-1991), Henri Matisse (Fr. 1869-1954) Iowa artist Marvin Cone (1891-1964). Plus important America, European, Russian, and Asian works of art. Including over 100 important American and European paintings and sculptures, over 100 pieces of Imperial Russian period artwork featuring Faberge, Imperial Porcelain Factory, paintings, and icons. Also French furniture, Tiffany, sterling silver, oriental rugs, Chinese porcelain, jade, cloisonné, ivory, decorative arts and much more. Just what is a Russian icon?